Last month during our town’s annual celebration of Longmeadow, known as Long Meddowe Days, the committee that organizes the event informed members of the Democratic Town Committee that the campaign signs on our Long Meddowe Days booth had to be taken down because they violated a “no political signs” policy of the committee. The fact that the Town Democratic Committee has always had a booth with signs at the event escaped the committee members recollection. In addition, the committee members at the scene claimed to have made a verbal agreement with our group not to display signs when we paid our $15 fee for the privilege of having a booth at the event. It turns out that no such verbal agreement was made with the Town Democratic Committee or its representative, but there was some sort of arrangement between the event organizers and the Town Republican Committee. 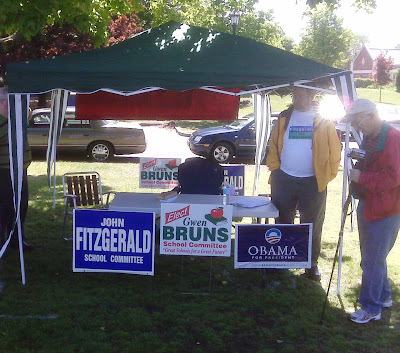 Why would the LDTC agree to pay $15 for a booth at which campaign signs were forbidden? The whole point of having a booth at the event is to introduce candidates to voters. It is the signs that attract passersby to the booth. They are, in fact, the least intrusive and most important aspect of such operations. What were the organizers of the Long Meddowe Days event thinking? The answer to this question becomes even more difficult to understand when you consider that “signage” at the booth was the only prohibition the organizers sought to enforce. They did not say that candidates could not campaign or hand out literature or any other political activity. Allowing these other political activities, but not the display of campaign signs is very bizarre, irrational even; until you consider the agreement they made with the Town Republican Committee, who apparently agreed to confine their activities to the Community House and did not pay to have a booth at the event. This information combined with very high likelihood that it was a prominent local Republican who complained about our signs to the committee, reveals the possibility that the committee was acting out of a misplaced notion of fairness, at best, or at the behest of a prominent town Republican, at worst. Maybe the Long Meddowe Days Committee assumed incorrectly that their status as a private organization allowed them total control over the time, place, and manner of signage on the green that day. Regardless of motive, the committee’s mistake resulted in a serious violation of constitutional rights that must never be tolerated again. Arguably just as upsetting was the very sad statement about the appalling lack of civic knowledge and civic mindedness that this incident may have revealed. The irony of a Memorial Day ceremony honoring those who have given the “last full measure of devotion” at an event where the organizers had hours earlier trampled on the very principles our military men and women fought and died for was almost too much to bear. The blank stares looking back at me when I explained this to the Long Meddowe Days committee members on the green made me feel like I was in an episode of the Twilight Zone. I only wish this frightening ignorance of the duties of citizenship were rare. Sadly, distaste for and ignorance of politics in the United States is all too common. In my three years living in Longmeadow and serving on the School Committee I have frequently noted and expressed concern about a tendency in our small town to avoid political conflict, to suppress serious disagreements about how to run our town instead of fully airing and discussing these conflicting ideas. Too many people active in running this town simply do not want to “cause a scene” or “make a fuss.” When the president of the Long Meddowe Days Committee asked me to lower my voice because I was drawing a crowd, I had to laugh (to avoid crying) as I loudly replied that DRAWING A CROWD IS WHAT FREE SPEECH IS FOR! The idea that drawing attention to political issues is untoward or perverse is itself perverse. Heaven forbid Longmeadow families be exposed to the people who are volunteering to oversee the education of their children. In what universe could signs for school committee candidates be considered “not family friendly,” as the organizers claimed at the scene? Immediately after the organizing committee had the Longmeadow Police confiscate the signs, I phoned an attorney who has since provided a comprehensive legal analysis of the matter. While the legal analysis fully supports the position I tried to make clear to the police and the organizers at the scene, I am more outraged at the attitude of the committee members who seemed to sincerely believe that political campaign signs at the event were “inappropriate.” The fact that the Green was littered with unattended commercial signage, that were explicitly for private profit and NOT the public interest, raised no concerns for the members of the organizing committee. What kind of community suppresses democratic political speech by people willing to serve the community as members of an unpaid School Committee, but facilitates and encourages the sale of goods and services with no discernable merit for individuals or the community? If politics is not an important and welcomed part of an event that purports to celebrate our town’s place in the American mosaic, then we have surely lost our way. I believe our town needs to do some hard introspection. We need to have a public discussion of this incident, not only to set the record straight and insure that next year’s Long Meddowe Days event really is family and Democracy friendly, but also to generate some badly needed civic involvement in our town. Too many of our residents find politics distasteful, something particularly dangerous in a town meeting form of government. The acceptance of an anti-politics mentality by many Longmeadow residents allows a small group of insiders to dominate local political decision making, something that is very unhealthy for the long term vitality of our community. Longmeadow faces very serious political problems that cannot be effectively navigated without greater participation by town residents. More of our neighbors have to do more and know more about town governance, if we are going to succeed in maintaining our town’s high quality of life. As I write these words votes are being counted at the Community House. It appears that of approximately 11,000 registered voters in Longmeadow, only 1500 or so fulfilled the most basic responsibility of citizenship in a democracy. Im starting to think we should say to the voters; if you can't stand the heat, move to a dictatorship. Preliminary totals show only ~ 15% voter turnout... a disappointment for such an important election. 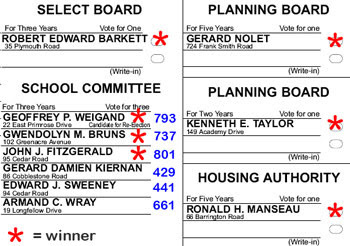 The School Committee (and Select Board) are facing some difficult decisions in the next 2-3 years.